SkyTrans Mfg., LLC was formed January 1, 2002 as a New Hampshire Limited Liability Company specializing in Aerial Tramway and Water Ride design, manufacture and service. With collective experience in the aerial tramway and amusement ride business in excess of 200 years, SkyTrans Mfg. 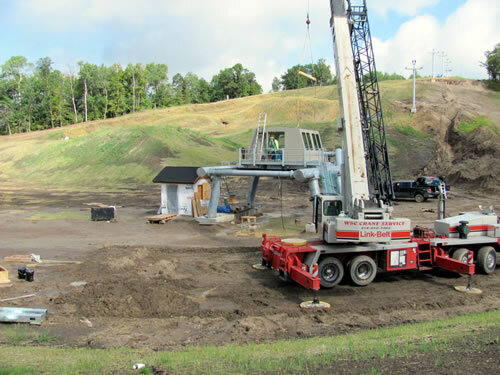 specializes in purchasing used aerial tramways from ski areas, refurbishing the equipment to meet both the ANSI B-77 Tramway code as well as the ASTM standards for amusement rides and devices, and relocating the equipment to zoos, parks and ski areas. In addition SkyTrans provides replacement parts service as well as non-destructive testing services for Amusement Parks and Attractions, Ski Areas and Zoos throughout the world. SkyTrans Mfg. can supply expertly designed replacement parts for a variety of rides, including those manufactured by O.D. Hopkins Associates, Inc. as well as others where the original manufacturer may be out of business or be non responsive to their customers.